I maintain several galleries, and although I've had a 500px gallery for quite a while I wasn't keeping it up to date. Just too many places to post an image to already. But after one of the editors gave me an editor's choice award for one of my photos I decided that I'd push some more images up to the site. While I was uploading photos one of the editors for Digital SLR Photography Magazine contacted me about publishing four of my images in the Portfolio section of the magazine. 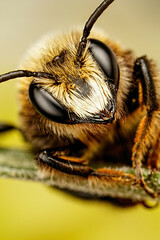 Three of the images would appear on a page with a short paragraph to describe them, and then a fourth photo would be printed full page (the image of a Mason Bee in the upper right hand side of this post). At roughly the same time that I was working on the text for the images my 500px gallery took off, and I'm not sure why. But over a weekend I had over two thousand new followers and it's been growing by over three hundred a day. As of this post there are over 13,500 people following my work at 500px! Special thanks to Mr. Jordan Butters, contributing editor for Digital SLR Photography Magazine, for such a great opportunity!